ChillBed’s $35 ChillTab 2 is a muscular little stand (roughly 4.8 inches wide and 6.5 inches tall) with an attractive exterior designed for home or office use. 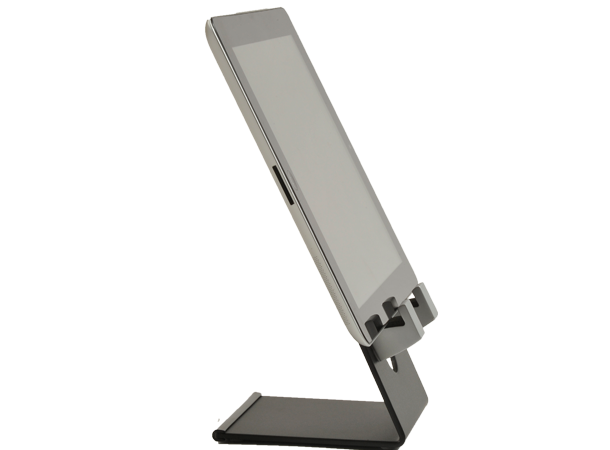 Approximately two inches above the stand’s base are two heavily padded brackets to hold your tablet in place. The bracket spacing can accommodate a range of tablet models, and even some smartphones, and the stand’s open design is compatible with most tablet cases and coverings. 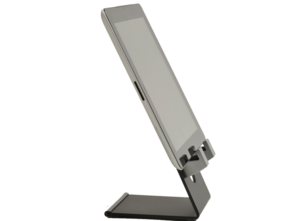 The ChillTab 2 lets you view your tablet’s screen in both portrait and landscape orientations, but for either, the stand is limited to a single angle of about 60 degrees—unlike with many tablet stands, you can’t adjust that angle. Consequently, the company recommends the stand especially for video conferencing, watching videos, reading, or recipe-viewing use in the kitchen. The stand itself has a black, powder-coated finish, and it looks attractive on your desk or around the house. 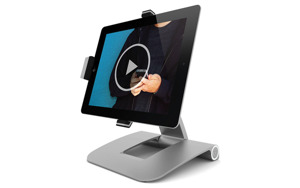 An added convenience is that, unlike with some tablet stands, the ChillTab 2’s brackets leave most of the bottom edge of your tablet exposed, so you can connect your charge/sync cable while using the stand. A circular cutout on the front of the stand, just below the brackets, lets you run that cable to a power source or computer without the usual cable clutter. The ChillTab 2 isn’t portable—it doesn’t fold up for travel—but it’s fairly light, so you could conceivably put it in a bag or suitcase, assuming you can arrange your bag to accommodate the stand's shape. The limited angle of the ChillTab 2 is disappointing, especially given its $35 price, but the stand is made from high-quality materials, and it has a reliable and sturdy feel. If you're looking for a tasteful, well constructed iPad stand for your home or office, and you’ll be using it primarily for screen viewing, the ChillTab 2 could be a good option. The ChillTab 2 is made of high-quality materials, and it has a reliable and sturdy feel, but it's limited to a single angle.